You may be sensing a theme here. Several weeks ago, before I started the Nautical Baby Quilt, I made this nautical divided basket. It has now been officially gifted along with the quilt (I'm an aunt again! ), so I'm finally sharing. This basket is a pattern by Anna over at Noodlehead. I always give myself a little pat on the back after I make something in 3D, and this is no exception! The fabric is all from the Daysail line by Bonnie & Camille. 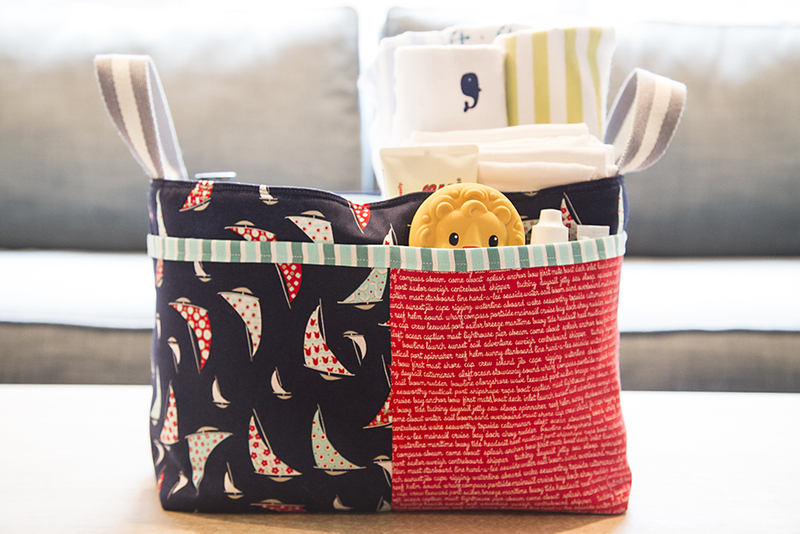 How cute are those sailboats at the text print? I have to apologize, as I have no idea where I got my webbing for my handles! It has been sitting in my stash for years, and I was so excited to finally have the perfect project for it. This basket fits a lot. I loved how Anna used it as a baby shower/welcoming gift and I did the same. I included diapers, diaper cream, nose spray, a bath toy, burp cloths and swaddling blankets. It's a pretty handy size. I could see it being used on a changing table, or even stored in a family room for easy diaper changing access. I definitely plan on making more of these divided baskets in the future!